WC-152-162 : Overnight plug-in Wall Charger for 12 volt battery packs. Fits batteries for Standard, ADI, & JRC radios. Polarity of charger (barrel plug style) is CENTER NEGATIVE. Temporarily out of stock. 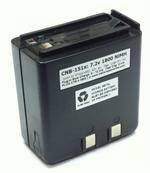 CNB-151 : 7.2volt 700mAh Ni-Cd battery pack for STANDARD, ADI, Heath, Relm HT radios. Temporarily out of stock. 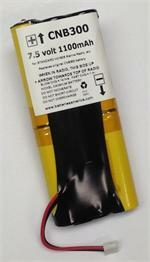 CNB-151x : 7.2 volt 1800mAh LONG LIFE rechargeable NiMH battery for Standard, ADI, Heath, & Relm radios. Fits C228, C528, C558, AT200, AT400. Replaces original CNB-151 (7.2v) etc. OUT OF STOCK. CBT252 : 10 x AA battery case for Standard, ADI, JRC. Holds Alkaline or rechargeable batteries (NiCd/NiMH). Output: 15VDC with 10 Alkaline AA, or 12VDC with 10 NiCd/NiMH AA cells. Has built-in charging port for NiCd/NiMH are used. CSA-181: Desktop Rapid Charger for STANDARD, ADI, JRC, etc. (Ni-Cd or Ni-MH, 7.2 volt thru 12 volt). Charges battery with or without the radio attached. Charges CNB-151, 152, 153, 161, 162, 163, 242; ADI-600, RBP-120, etc. CNB-152xse: 12 volt 2000mAh READY-TO-USE eneloop NiMH battery for Standard, ADI, JRC radios. Replaces original #s RBP-120, CNB-152, CNB-151, CNB-153, CNB242, CNB244A, CNB244B, etc.